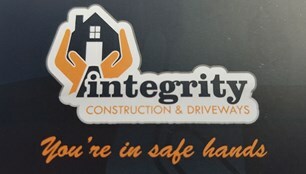 Integrity Construction and Driveways - Builder, Driveways/Patios/Paths based in Fareham, Hampshire. For Driveway related enquiries, please contact Matt on 07568 548989. For Building related enquiries, please contact Danny on 07790 367851. This partnership has been formed following over thirty years of experience and friendship between us. We specialise in extensions, driveways, patios, drop kerbs, soft and hard lanscaping including new pond installations and all types of brickwork plastering and rendering. We take great pride in our work and as our name suggest, honesty is as important to us as it is to our customers.